Red Thread Charities – “Give to the Max” on Tuesday, November 17th!!! Tomorrow, November 17th, beginning at 8:00 a.m. and continuing for 24 hours, contribute to Red Thread Charities at GiveMN.org using your credit card and your gift will be increased by sharing in a $500,000 match from the Saint Paul Foundation, Minneapolis Foundation and Bush Foundation. No transaction fees will be charged, so 100% comes to Red Thread Charities, but it must go through the GiveMN.org website! I’m really hoping to get into PT school so I was thrilled that I got to be an assistant in the therapy rooms. An infant girl was brought into our room. As I looked at her I noticed she had very little animation in the way of facial expression or activity. During her OT screening she barely responded making if very difficult for the therapist to make any recommendations. The PT was finishing up with another kiddo so I went on to hold her while we waited. From instinct I started to bounce and swing this little girl, close to my body, like she was my own child. Once we started the PT evaluation, she was much more animated, responding more to our prompts than before. 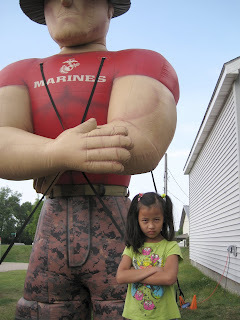 The OT that was in the room was surprised, saying, “Is this the same little girl?” Then we went on to talk about what could have caused the change in her behavior. The OT got very excited when I said that I had rocked her and such. This simple motion had helped stimulate the little girl and that stimulation helped to wake up her system. It was so interesting for me to see the impact of such a small action on my part. It took so little of my time but it meant the world to this baby. If we all gave a little bit of our time, not only in a foreign country, but also in our local communities, we could get a lot done. Something as simple as listening to a child’s 47th story of the day could [loosely] help the world by instilling creativity and intelligence in one kid. It may sound cliché but this event made me truly believe it. 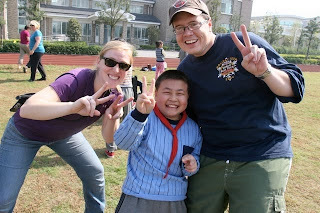 I am so thankful for our volunteers who pay their way to China and give their time and expertise to help the children. I love the way parents in China adorn their children with jade and string jewelry for luck. I remember a child in Guiping who had a jade necklace on that looked like he'd worn it for a long time. He was 3. I asked about it and the nanny told me that he was found as an infant wearing the necklace and they dared not take it off because the mother surely placed it on him for good luck. When we adopted our daughter Quin, we stayed at the Wanghu Hotel in Hangzhou. Since we were foriegners, we were given a room on the 4th floor. 4=si=death. Chinese people consider 4 a very unlucky number. Some hotels don't even have a 4th floor. We were madly in love with our daughter and we were oblivious to this ominous number. Actually, the number '4' has always been my lucky number and I still consider it so. I just love these photos of kids with lucky necklaces. There were many. I wonder if any of you adoptive parents received your children with a lucky necklace or bracelet. How cool would that be? Here are two more kids sporting handknits. Every fashion forward baby should have a little wool vest to wear over a sleeper on these crisp fall days. I believe it is very comforting for families to find out that the child they are waiting so patiently to bring home is living in a foster home close by the orphanage. The foster families we have encountered are almost always older couples with grown children. They are very devoted to the child they are looking after, very affectionate and also very proud. Many children had on hand knit sweaters, vests and pants lovingly made by the foster mother. I know this because I have been a knitter in my lifetime and I can recognize a handmade garment. Also whenever I saw a little handmade sweater I asked the foster mother whether she made it. A nod and a smile was always the answer. It felt very familiar walking down the road from the bus stop into Lanxi SWI. Four of our child volunteers spent the better part of one year living in this orphanage. Most of the kids at this small facility have been placed but a few are still waiting. We invited families in the community to bring their children with special needs in to be checked and so once again our team spent a full day of examinations and screenings. Families were given therapy instruction and toys to bring home. Even though most of the children we saw from the community had profound special needs, our team was able to give hope in the way of therapy to some very dedicated families. 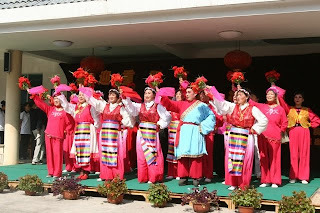 And, once again, just to help us remember that we're really not in Kansas...or St Paul...or Mpls...or River Falls, a senior citizen dance ensemble performed a robust chinese opera on the orphanage grounds. Having 10 child volunteers on the trip has been a delight. We have 9 girls with us: Mia, Ava, Quin, Zoe P, Zoe G, Jin Jin, Ellen, Grace, Paige and one boy, Jack. Our kids have been able to have the run of the orphanage and help with the PT /OT demonstrations by being models during the lectures. I think Jack has really enjoyed being the only boy on our trip. I look over at the kid's table at dinner and watch him going around the table pouring small amounts of Sprite into the girls glasses and toasting each one. This young man is smooth. Yesterday Jack slipped a note under my door that he wanted posted to the blog, so here goes: This is from Jack: "I really enjoyed being in the OT and PT rooms and being an assistant. The kids were all really fun and playful. I think they are all adoptable. 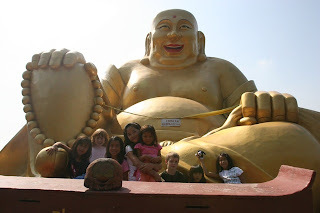 I loved this trip to China and want to do something like this again...I think." 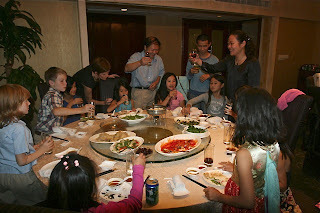 The folks from Hangzhou Childrens Welfare Institute and Red Thread Charities had a swell party today. We played outside with the kids and staff and the children were just amazing! This afternoon we finished our work with Hangzhou CWI and got on the bus heading to Lanxi SWI. Our team said a fond farewell with great hopes for next year's trip. This morning I give my presentation on Down syndrome. I'm so excited about it that yesterday I gave much of the information to my nurse helper. She was surprised to learn that families in America adopt children with Down syndrome and can't imagine their life without that child. I have so many photos and kind messages that families have sent me to share!! I think this little baby is so cute. After we finish the medical exams it's so nice to walk into the therapy rooms and see how much fun the kids are having while they are getting their therapy screenings. Here are a few photos. Last night we had an "official dinner" which means we had dinner with the official leaders of the city. 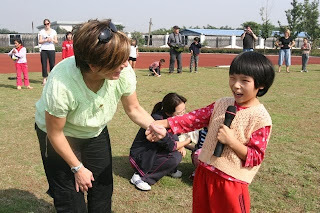 The vice director of Hangzhou toasted the children and was clearly delighted when Zoe Parish was able to speak mandarin to him. The children are all able to consume enough with chopsticks to keep them well nourished. They were quite intrigued with the boiled chicken with it's head still on the plate. I asked Quin if anyone ate the chicken and she said. "We made Jack take the head but he only played with it." We have two volunteers who share the same birthday. I won't reveal their ages but they are exactly 30 years apart. Happy Birthday to Tim and Bridget! A warm wishes party was planned by the staff at Hangzhou complete with a huge cake. Bridget received a jade bracelet as a gift and Tim received a really cute plastic beaded mouse. Lunch here at the Hangzhou CWI today was water squash soup and along with eel with garlic and ginger. A little boney but really quite delicious! The therapy screenings went very well. If RFAH is looking for their spare oximeter, it's here in China. (Thank you to our respiratory therapist Brandon!) We are seeing a fair number of kids with cardiac conditions. 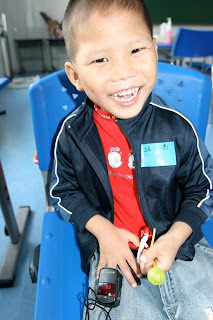 Some of the children have had their ASD and VSD and Tetrology of Fallot successfully repaired right here in Hangzhou. If I could give a shout out to any parent wishing to adopt a child with special needs, these kids are really healthy!! Jack got to help in the childrens area and was a big help disinfecting the toys! Thanks Jack!!! 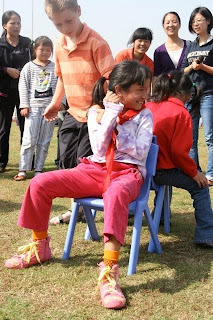 The beauty of the children in Chinese orphanages never ceases to amaze me and yesterday was no exception. 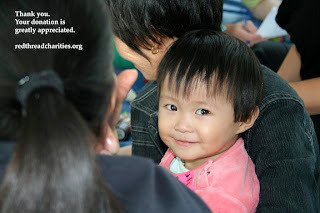 Our volunteer group examined and screened a great number of children living in foster families in the Hangzhou countryside. We were happy to see that most foster families only had one child and some had two. Here is a story that I thought was sweet. I examined an adorable baby boy and was told he had a twin brother who I would be examining next. One was found and came to the orphanage one day and a few days later the twin was found and brought in. Both are happily living in foster care. I asked the staff how they knew they were twins and they looked at each other, laughing, and said, "Because they look exactly alike!" Genetic studies aside...I guess some things can just be done the old fashioned way. Our group had a very full day of exams. The non medical staff is becoming quite educated in OT and PT. 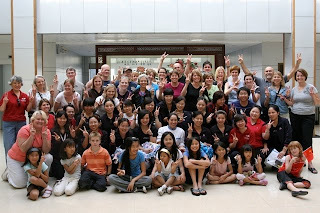 Six of the group came two days early so that we could meet with the directors of a special education center in Shanghai. The connection was made a few years ago when meeting with members of the Shanghai Minnesota Club which is surprisingly quite large. The school is run by Monte & Sherri Rosen, U.S. citizens most recently from Seattle, and currently serves 20 special needs children in a school like setting. They also consult with many international schools in the area. Both of these programs serve the ex-patriot community. 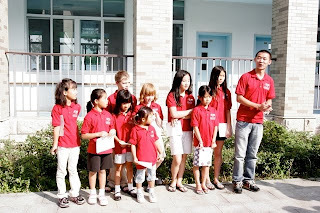 This past summer they held a day camp for autistic Chinese children and at the same time held classes for their mothers. They employ occupational therapists, physical therapists, speech therapists, and many aides. The professional staff are American and European citizens. The meeting was successful and it was decided that our two organizations have a lot in common. We are looking into having some of their professional staff visit Hangzhou periodically to do training. 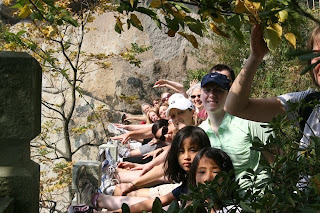 Sherri and two of her staff will be spending Sunday with us in Hangzhou. The second extra day in Shanghai covered extremes. We started with a large Buddhist temple, then moved on the French Concession where we found a nice park with great adult exercise equipment, and we ended with the Barbie Wa Wa store! Yes, the largest Barbie store in the world is right in Shanghai! Five floors of Barbie plastic, the majority of it with blond hair! We had a fun time, walking the runway & checking out the displays! The rest of the group arrived in Shanghai on Thursday night. Friday morning most of us went to the Yu Garden. An amazing garden built by a government official for his mother in about 1500. Of course, it is surrounded by a maze of little shops for all the tourists! We all left for Hangzhou in the early afternoon and are now at the orphanage, about to spend a very full day checking all the children that are currently living in foster care. Hangzhou is the capital of Zhejiang province and this is to be the premier orphanage for the province. They just moved into a new set of buildings a year ago. They have two guest houses on the orphanage grounds so that staff can come from the smaller provincial orphanages for training. We are lucky to be allowed to stay in the guest houses which are very nice and helps with the commuting time since traffic in China is awful! Right now as I am writing this it is early morning & I am listening to the sounds of young children & Chinese music. The nannies are busy feeding the children and starting the day. It is a very peaceful setting. After a full day of touring the beautiful city of Dali, we are all sufficiently sunburned and ready to meet the group later today in Hangzhou. 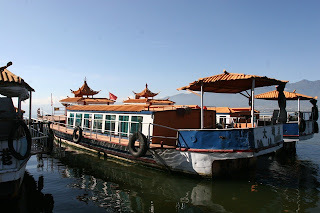 Here are a few photos of our cruise excursion on the lake to another temple and to a little fishing village. The red ribbons in the photo are the ones that the Buddhist monks give people as a blessing for their health and longevity. They are tied everywhere, even the trees. If you have a fig tree in your village, it is said that the village will prosper. The highlight for me was the hike up the mountain. At the top there was a little resort people could stay. The family who lives at the top of the mountain let us in their house. Right outside there is a little cave grotto for people to meditate. Tomorrow we will be leaving Dali to meet up with the rest of the group in Hangzhou for the official start of our orphanage trip. We think they are on the plane right now and will be landing in Shanghai within hours. Yesterday we drove 4 hours by bus through gorgeous Chinese countryside watching farmers in their fields harvesting rice and other vegetables. We arrived in Dali, and toured a temple that went on and on like the Forbidden City in Beijing. 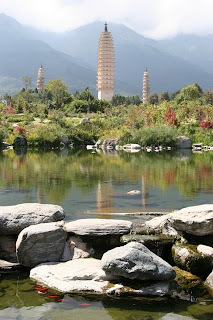 The three pagodas in the photo withstood the earthquake in 1997 but 2 of them are a little tilted. We are enjoying our tour of western China a great deal but are very excited to meet up with the group and see the children in Hangzhou and Lanxi. Today we traveled by bus to Tiger Leaping Gorge in the foot of the Himalayas. Really, I for one, would say it might be the most beautiful place on earth. Our group of 4 children had fun playing in the back of the bus on the way. We stopped briefly for a photo op overlooking the mountain. 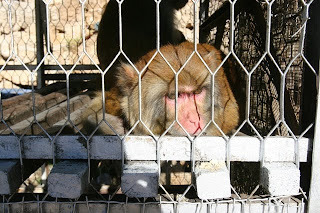 For the sake of tourism, there were monkeys in cages and the children were quite intrigued with them. Jack picked up some sunflower seeds and was able to let the monkey take it from him. Paige...the beautiful little red-haired girl, bent down to pick up a seed under the cage to do the same. (All of China is quite infatuated with Paige's red hair.) Apparently the monkey was too. Curious George put his little hand through the cage and grabbed Paige's hair firmly and would not let go! Our guide,Norman was able to extract the monkey's hand from the red locks but it left one little girl feeling quite traumatized for about 15 minutes. 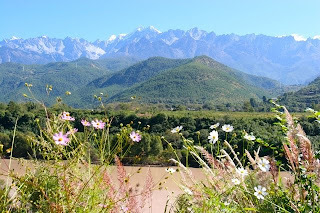 On October 12th we hiked in Yulong Snow Mountain in Lijiang China near Tibet. We are in the foothills of the Himalayan Mountains. 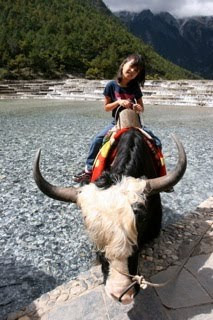 We got to dress up in traditional dresses if we wanted to.We also got to ride a yak! 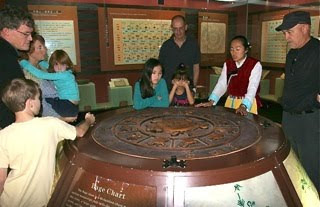 Later we went to a museum and studied the culture of the people who have lived in the area for centuries. They have their own system of writing indigenous to their culture. They love to sing and dance and we saw their nightly performance. It was very beautiful and colorful! Babies with cleft issues are born everywhere in the world. A cleft lip is an opening in the upper lip between the mouth and nose. A cleft palate is when the roof of the mouth has a hole in it. There are varying degrees of severity of this condition but thankfully all the structures of the mouth are present, they just need to be put together by a skillful plastic surgeon. Some surgeries take as little as 45 minutes. 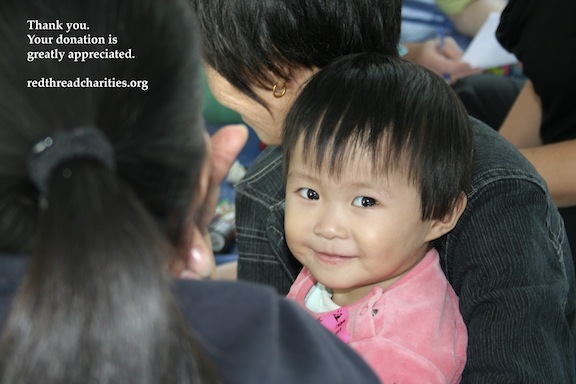 Children with cleft issues are being adopted at a growing rate. 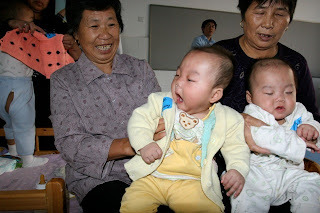 I personally know 6 children adopted from China with cleft issues. And actually many more from parents groups on listserves. Red Thread Charities has donated cleft nursers and given instruction on the care and feeding of children with cleft. 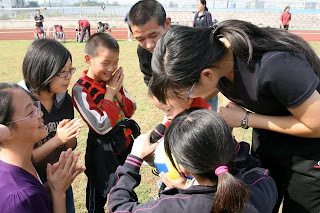 Many of the children living in Chinese orphanages have special needs. Needs such as cerebral palsy, cleft lip and palate, cardiac abnormalities, and limb deficits to name a few. Families in the US, Spain, Canada, and Sweden happily adopt these children with special needs and overwhelmingly say they cannot imagine their lives without their child. Kids who live or have lived in an orphanage have some degree of sensory defensiveness and delay and can benefit enormously from OT and PT. Red Thread Charities has set up developmental training centers in 2 orphanages. The staff in each of these orphanages is trained and are able to independently carry out the techniques taught to them to help the children. Both orphanages plan to open their doors to families in the community with children who have special needs. China is such a beautiful country. 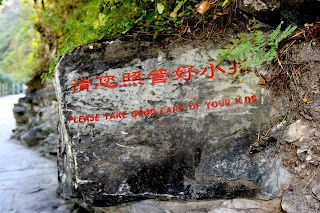 Here is an image taken last October in Guiping while hiking up a mountain. 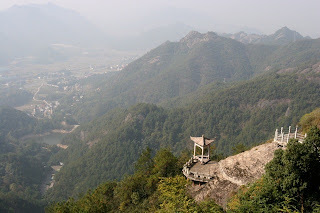 This mountain overlooks Guiping Social Welfare Institute in Guanxi province. 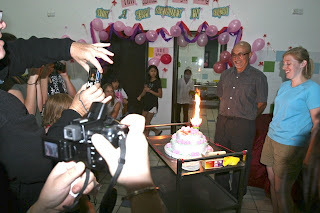 It is home to over 40 children with special needs. Red Thread Charities has worked with this orphanage for 3 years. 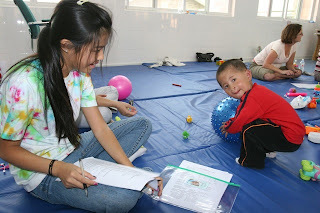 They are now independently running a PT / OT /special education program for the children. Our October 2009 volunteer trip starts in just a couple of weeks. 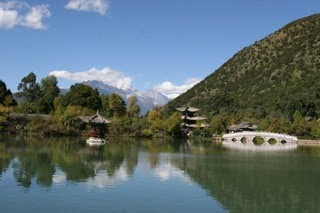 Some of us are leaving a little early on the 9th in order to tour for a few days in Lijiang. The 26 volunteers and 10 of our kids will meet up in Shanghai on October 15 and will travel to Hangzhou the following day to start working with the children and staff at Hangzhou Children's Welfare Institute. We will be examining the children and sharing techniques in physical and occupational therapy, and special education. We will be giving medical advice regarding the children needing it and lectures are planned and already translated into Mandarin! Each of us willl have an interpreter. I am inviting all the volunteers to help me keep this blog interesting for the duration of the trip. That shouldn't be too hard to do as it will surely be a fascinating time. It can be shared with all friends and family so they can actually see our insider's view of China.